Some 100,000 Kurds are believed to have fled Kirkuk since Iraqi government forces took over the oil-rich city this week, for fear of sectarian violence and reprisals after their banned independence referendum. Euronews spoke to one of them: a Kurdish man who asked not to be identified because he has worked closely with Iraqi forces. He fears the tension in the area could lead to civil war. “I was crying about the whole situation on my way from Kirkuk to Erbil – just one hour crying, I couldn’t stop. It’s really frustrating,” he said in a phone interview from the city of Sulaimaniya, roughly 100 km east of Kirkuk. He fled Kirkuk as soon when Iraqi forces stormed into the city early on Monday (October 16), largely unopposed after most Kurdish Peshmerga forces withdrew. The Iraqi forces also took back control of Kirkuk oilfields, halving the amount of output under the direct control of the autonomous Kurdistan Regional Government (KRG), dealing a major blow to the Kurds’ bid for independence. Iraqi authorities have assured Kirkuk is safe and thousands of families returned to their homes this week. The city’s Arabs and Turkmens, who opposed Kurdish rule, have even celebrated the government’s intervention, driving through the streets firing weapons in the air. Sunni-Muslim Kurds comprise the largest community in Kirkuk followed by Shiite Turkmen, Sunni Arabs and Christians, according to the Iraqi Planning Ministry in Baghdad. But just three weeks after they voted for independence from Iraq, many Kurds in this multi-ethnic city fear reprisals and sectarian violence – the start of a new spiral of chaos for the country. Kurds have sought independence since at least the end of World War One when colonial powers carved up the Middle East after the multiethnic Ottoman Empire collapsed, leaving Kurdish-inhabited land split between Turkey, Iran, Iraq and Syria. 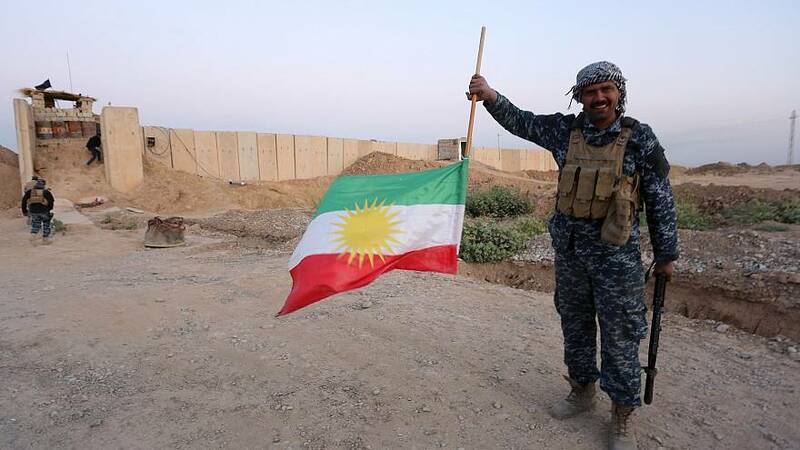 KRG Peshmerga forces were deployed into Kirkuk in 2014 when Iraqi government forces fell apart in the face of an offensive by Islamic State insurgents, preventing the oilfields from falling into jihadist hands. The territory taken by the Peshmerga as it rolled back Islamic State was outside the official boundaries of the autonomous KRG, mainly in Kurdish-populated areas claimed historically by the Kurds. With this week’s withdrawals from disputed territories, Peshmerga forces appeared to have re-deployed roughly along the KRG’s boundaries. “As of today we reversed the clock back to 2014,” an Iraqi army commander, who asked not to be identified, told Reuters on Wednesday (October 18). About 18,000 Kurdish families have since taken shelter in the cities of Erbil and Sulaimaniya, the governor of Erbil told reporters on Thursday (October 19). One of his aides said the total number of people was about 100,000. The Kurdish man who spoke to Euronews from Sulaimaniya said many of these people had nowhere to sleep and were huddling in local mosques. He said they fled Kirkuk for fear of abuse at the hands of Hashid al-Shaabi, Shiite paramilitaries, also known as Popular Mobilisation units, assisting government forces’ operations in the region. Lisa Grande, the U.N. humanitarian coordinator in Iraq, has urged all parties to do their utmost “to shield and protect all civilians impacted by the current situation”. Iraqi Prime Minister Haider al-Abadi said on Wednesday that security was being maintained in Kirkuk by local police backed by the elite Counter-Terrorism Service, trained and equipped by the United States mainly to fight Islamic State militants. “All other armed groups should not be allowed to stay,” Abadi said. Still, many Kurds are afraid and offended by the presence of Iraqi forces in Kirkuk, and tensions are rife. “If it stays like this… it’s going to be a civil war,” warned our source from Sulaimaniya.